IDADA presents the First Friday Art Tour, featuring 39 downtown venues. 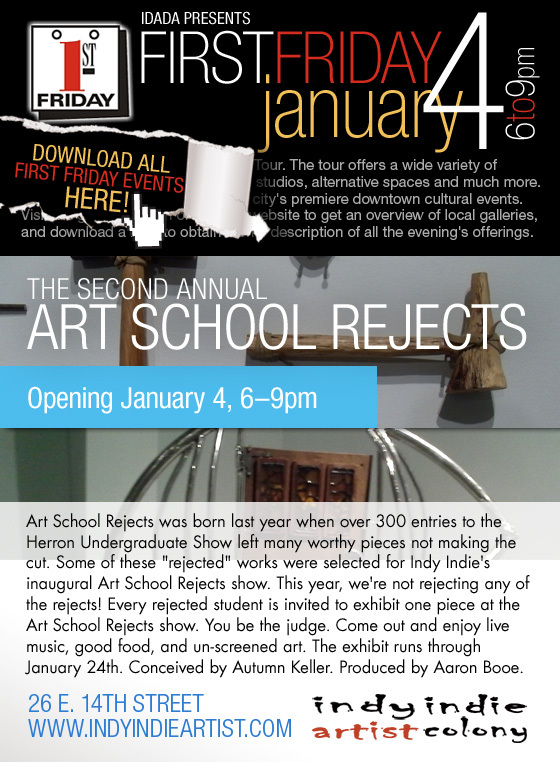 The Second Annual Art School Rejects Show is opening at the Indy Indie Artist Colony. "Animal House" is the featured theme of the Galleries at the Harrison Center for the Arts. And last but not least, the closing reception for "TINY" (tiny artwork) and the re-launching of "Be Indypendent," the buy Indy art movement is at Gallery 924. IDADA presents the First Friday Art Tour, featuring 39 downtown venues. The Harrison Center is hosting the 2012 Borshoff Annual Gallery Show. Rosanna Hardin Hall and her guest artist Fritz Kackley will have their paintings on display and for sale at the Villa Dell' Artista. "Homage to Sixto Diaz Rodriguez" exhibition is featured at the Mass Ave Wine Shoppe and the "Global Space" exhibition is at IMOCA. Last, but not least, the "First in Line" event is at the Stutz Art Space. IDADA presents the First Friday Art Tour, featuring 39 downtown venues. The Marsh Gallery is hosting an opening reception for the first year Graduate students of the Herron School of Art and Design and the poetry students at IUPUI. Afterwards, everyone is invited to visit the Lobby Art Space at the Madame Walker Theatre Center for the opening reception of "Love is the Master Rhythm," an exhibition of new paintings by Samuel E. Vazquez. IDADA presents the First Friday Art Tour, featuring 39 downtown venues. Begin the evening with Mass Ave's Harvest of the Arts featuring live music, performance artists, showcases, and culinary arts. Afterwards, visit Primary Gallery for the opening reception of Indianapolis painter Stan Blevins. More local artists can also be seen at the Harrison Center for the Arts which is featuring "Food Con3" with an interactive mural. Last, but not least, Richard Emery Nickolson will open the Fall season at Dewclaw with "An Apotropaic Symphony." This opening reception features watercolors on paper reference pictographic symbols that have both representational and abstract functions. IDADA presents the First Friday Art Tour, featuring 39 downtown venues. The Harrison Center for the Arts is hosting the 8th Annual IDADA Membership Exhibition and opening reception. Next, check out the opening reception for Michal Lile's Transitions & Possibilities at Gallery 924. Afterwards, visit the Kuaba Gallery to preview the upcoming exhibit "Teeth and Tongue, " featuring new works by painter Steven Sickles and mixed media sculptors Tony Bayles and Bruce Lyons. IDADA presents the First Friday Art Tour, featuring 39 downtown venues. The Earthhouse Collective presents "Feminine Mystique." This multi-media exhibition includes paintings, drawings, prints, and sculptures by Mary Beth Verdone and Jaymi Tharp. Next, view paintings by artist Katrina Murray at the her opening reception hosted by WUG LAKU's Studio & Garage. Finally, finish the evening with "Speechless Language" and "Teefville" exhibitions at the Indy Indie Artist Colony. IDADA presents the First Friday Art Tour, featuring 25 downtown venues. 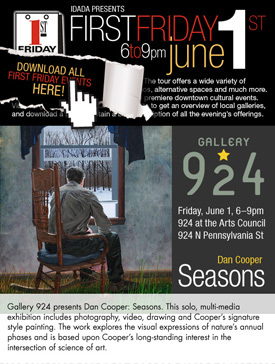 Gallery 924 presents Dan Cooper's Seasons. This solo, multi-media exhibition includes photography, video, drawing and Cooper's signature style painting. Next, view paintings by artist Kate Oberreich at the her opening reception hosted by Nancy Lee Designs. Finally, finish the evening with "Universal Language" an exhibition at the KUABA Gallery that features new artists, new mediums, and new works. IDADA presents the First Friday Art Tour, featuring 25 downtown venues. Join the new IDADA gallery Arch at Chatham, for the inaugural exhibit, "Two Ghazals," pigment prints by Dorothy Stites Alig. Then visit the Athenaeum Artspace for exhibits featuring three perspectives on Haiti: beauty, heartbreak, and empathy. During this exquisite exhibit, enjoy free wine and appetizers from the Mass Ave Wine Shoppe. Finish the evening with "SOS," sculptural work by design engineer Dominic Sansone at WUG Laku's Studio & Garage. The Alkis Keramidas Museum of Art is hosting the Indianapolis Suzuki Academy's Fourth Annual Soiree. The ISA Soiree Fundraiser will feature fine wine, dinner, a silent auction, and live entertainment. IDADA presents the First Friday Art Tour, featuring 25 downtown venues. 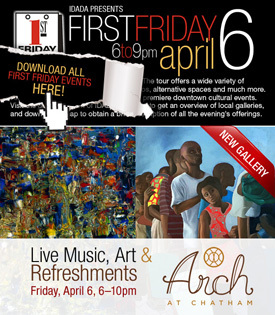 Join the new IDADA gallery Arch at Chatham, for a beautiful Spring evening of art, music and conversation. Then visit the new IDADA gallery member Dewclaw for "Night Driving," a group of paintings based on an experience Anita Giddings had while driving at night. Lastly, challenge your perception of space and understanding of what a painting & sculpture can be at the new 3 Mass gallery. The Alkis Keramidas Museum of Art is hosting the Indianapolis Suzuki Academy's monthly board meeting. IDADA presents the First Friday Art Tour, featuring 25 downtown venues. The Alkis Keramidas Museum of Art is one of the local museums. The Late Night After Party, featuring live cabaret, is at Chef Joseph's at The Connoisseur Room.